Yama Zuki and Kempo Connection? Ok here's is something that has been driving me crazy for years. The point of tha Yama Zuki. 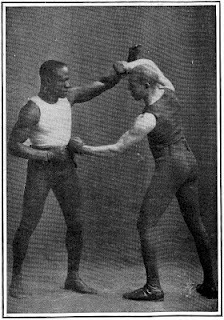 I looks like the hand in back is used as a overhand which is a punch that I make a LOT of use as someone who practices and spars in the form of kickboxing taught in my dojo. It seems like an easy punch to use with a fair amount of power but the lower hand still perplexes me. One possible theory I constructed when a friend of mine was showing me Kempo. He had me stand still and take a couple hits only to find the way my body buckled from each specific impact in disturbingly consistant/entertaining ways. The light bulb went on above my head when he did a downward strike to my stomach, causing my head to come downward but mostly forward. Considering how my head gave forward momentum to add to the momentum of my attackers fist to my face, could the lower hand of yama zuki be used to cause the forward buckling reaction? And if we consider reaction force, my being hunched over thus my hed being in front of my first vertibrae, could this put me in the position to not be able to roll with the punch? Ok here's is something that has been driving me crazy for years. The point of the Yama Zuki? I hope that gives some food for thought and I’m sure others will share their thoughts on this motion too. As an aside, Iain, as a certified pedant I LOVED your comments om the "u-punch" / "c-punch." For application I go with Iains for this technique for a few reasons. Chuck Lidell taught me the overhand hook and it's hellishly powerful. My personal critique, which may be born out of who was teaching and for what context, was that it took too much set up. It wasn't something just that naturally happened like a job or cross. That's a good point. However in the correct scenario it certainly is a technique you could rely on. One of my sequences from Jion uses the overhand hook ( actualluy the left if dealing with an opponents right hand). However to be effective it is preceded by a technique which fits the context of the drill I'm thinking of. It is the the first technique that creates the opportunity to deliver the second. 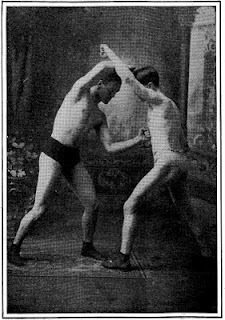 I take your point about straight techniques and later in Jion the same scenario plays out but with a straight technique to start the sequence ( Shotai Uchi). The deciding factor on which to use comes down to the energy transmitted from my opponent. The motion IMO is closer to the opening of Pinan Nidan, Yama is of course close but not the same. we do in naihanchi dachi which gives both hands better structure as opposed to Neko Ashi Dachi- but of course this is only one Bunkai. Great photos! Many thanks for sharing those. Fascinating! Chuck Lidell taught me the overhand hook and it's hellishly powerful. Something has just occurred to me. The title of this thread isn't just about Yama Tsuki but the Kempo connection. And then I reference Chuck Lidell. Now I think about it this is screamingly obvious but my greymatter isn't working so well at the moment. Interestingly, of the style it states "The Koei-Kan kata syllabus includes 5 Pinan Kata, 3 Naihanchin, Sanchin, Sanseiru, Seisan, Chinto, 4 Kushanku Kata, 2 Passai Kata, Sepai, Gojoshiho, Suparinpei, Jaken Ichiro and Renchiken Ichiro" which makes me wonder if Mr Lidell didn't acquire this technique from his Karate rather than from his Kickboxing or MMA. Going off on a slight tangent, other notable MMA fighters cite their Karate as being fundamental to their MMA including Georges St. Pierre and Lyoto Machida. Just look at the sheer power of those punches. As a point of inteest to both MMA and non-MMA fans, one of my favourite UFC matches is Chuck's final match which was against Rich Franklin in 2010 if only for the sheer spirit shown in the match. Punching full force with an arm already broken by a kick early in the match! Edit 1: off the back of my above post, I've just re-watched the match. 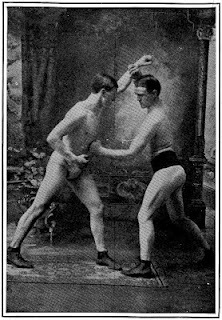 In it, Chuck grabs the rear of Franklin's right knee with his left hand then throws an overhand right to the head for a takedown. If that's not demonstrably effective bunkai of yama tsuki then I don;t know what is. That one technique has suddenly inspired more respect from me for that particular movement. Edit 2: I now realise that I mentioned Chuck's Kempo... and then referred to Koei-Kan Karate which isn't all that logical. I said the greymatter wasn't working well. And the dots do join up. My point essentially remains; the validity of karate in MMA. Just my own experience here of course - at least with the tighter version seen in Goju Ryu, it is pretty much what it looks like, and is relatively close to Ian's video. Just have someone hold out an arm, put out a "guard" hand or whatver, use the lower arm to drop the gaurd (and hopefully snap the head forward) while you come with kind of a tight overhand with the top hand..that's pretty much it. You can also immediately reverse the motion into another "upunch" with the new lower hand used to prevent them using their shoulder for blocking your next shot. I like the overhand punch Iain does and it corresponds nicely to being attacked from the rear: over arm bear hug from behind > single handed groin seize resulting in wrist grab > responded to by the punch. (for Bassai reach and grab the head and rotate so they face away from you and then kick to the back of the leg to take to the floor). The same can work for the taller posture more commonly found in the naha-based forms, but the taller the posture the greater the limtation on stability. It's certainly correct that the angle of contact can affect how the target's body reacts, so ideally you'd want the lower technique to happen marginally before the upper one if it's purpose is to bring the head forward to meet the upper technique. I realise that meridians aren't every kareteka's 'cup-of-tea', but in some styles the lower and upper techniques aren't delivered vertically but skewed with the lower one towards the gall baldder and the upper one closer to the heart; in which case an initial strike to the GB meridian could be seen as 'setting up' or sensitizing the HT meridian for the immediately following strike (If you go with this view, then you would always deliver yama tsuki with the same skew, no matter which side you started from). Here is a clip of one thought I have on the technique. "Quadrant theory." If I recall correctly, Paul King from Peterborough taught me that. Sode Tsuri Komi Goshi. The sleeve lift-pull hip throw. Lovely throw both in competition and exhibition. The chap in the video explains it very well but doesn't show the actual movement very clearly. It's worth surfing YouTube for videos of it. That's the throw I use for that turn and posture...just never had the name of it. Not a massive fan of the meridiam 'set ups' due to accuracy issues but none the less they are worth exploration. Finally got round to filming and editting. Hope this is of some use. Of course it is ONE PERSON'S perspective. As stated, there are many other options and perspectives. Very interesting applications, thanks for sharing Mark and Tau! I on believe on one of Iain's bunkaijutsu video, he uses the spin after the mountain punches as a tai otoshi. Fascinating seeing everyone's perspective!